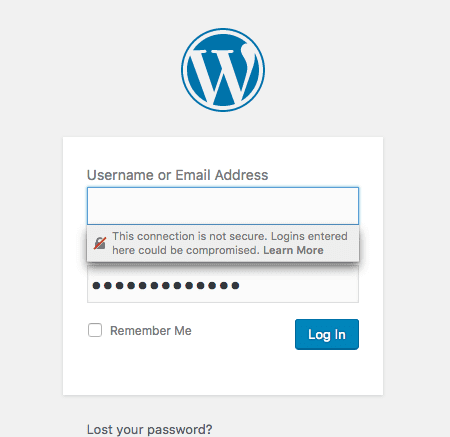 I have had a few clients contact me lately that they are getting a "weird" security error when they try and log into their WordPress website. The image above is an example of what they are seeing. "This connection is not secure. Logins entered here could be compromised. Learn More"
You will typically see this when using Firefox. This is Firefox's version of security warnings similar to what Google Chrome is now doing in the web address. You can read more about it in a previous blog post. Your site has not been hacked, nor has any information been stolen. This is a warning that your site does not have an SSL Certificate installed and your web address is http://www.yourdomain.com and not the preferred https://www.yourdomain.com. If you have a security certificate installed you would no longer receive this error. This is part of the online communities goal of making the internet safer. They believe if all sites have a security certificate installed (SSL) that the internet will be safer. SSL Certificates can be purchased and installed on your website host. You can read about it in my previous article.